For novel ideas about building embedded systems (both hardware and firmware), join the 30,000+ engineers who subscribe to The Embedded Muse, a free biweekly newsletter. The Muse has no hype and no vendor PR. Click here to subscribe. 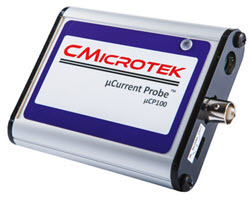 Thanks to the fine folks at Cmicrotek, this month's (April, 2019) giveaway is (your choice) either a µCP100 or µCP120 current probe. These are instruments that measure the current consumption of low-power IoT-type systems. I reviewed them here. Enter the contest here. It's not much fun reading the morning newspaper anymore. Carnage abroad, crazies at home, and even the fun news (tea-dumping tax protesters, for instance) tarnished with tales of violence or government intolerance. Then there's the economy. This morning I read that Xilinx is laying people off. That's on top of Microsoft, Intel, IBM, AMD, TI, Freescale, ST, Motorola, Linear Tech, and too many others. A few months ago it seemed that engineering was relatively safe. That has changed. Not a day goes by that I don't hear from at least a couple of engineers suddenly dumped on the street. Nearly all express fear they will never get another job in this field. Interruption: while typing this my best friend emailed to report his consulting business evaporated this morning. What does one do when suddenly losing their livelihood? First, read this article from EDN's Innovator's insert: http://www.edn.com/article/CA6643375.html?industryid=47479 . The author gives both useful advice for job-seekers plus some horrifying background. For instance, the IEEE has found that aging engineers are screwed. For each year of experience expect an additional 3.5 weeks of unemployment when you get the sack. That doesn't sound like much till one multiplies it by the average experience of an engineer in the US. 52 weeks, a year, without a job. How many of us can survive that sort of tsunami? If you're a bit older, with kids in college, expect two years of job hunting. The author also suggests that those out of work get professional help in creating resumes and interviewing. While that's excellent advice, paying a pro while living off savings is a double whammy. Do check out my thoughts on resumes (http://www.ganssle.com/sellyourself.pdf), and at the least work with friends and practice interviewing. There's no substitute for practice in most endeavors. Practice with several - even many - people. Ask them to be relentlessly harsh. Finally, the article notes that networking is important, and claims 50% or more of all jobs are found via this social interaction. But there's one point that is missing: start networking now, even if your job is secure. Bad stuff happens to good people, and most engineers, unhappily, will face one or more layoffs over the course of a career.